Having furnace problems? Before you call in a professional, check our list below. To help you save some money, we’ve listed 3 of the most common furnace problems in Phoenix, Arizona and what you can do on your own to solve those problems. If you’re still having problems with your furnace after checking out this article, just contact us and we’ll send over a Phoenix professional to help. Furnace running but only blowing cold air? Well, a lot of things can cause that to happen. Let’s see what you can do on your own and what might require a professional. 1. Check your thermostat. Make sure that it’s set to HEAT and that the fan is set to AUTO. 2. Check and change your air filter if needed. A clogged air filter means less air gets blown over the heat exchanger. When that happens, a safety switch shuts off the burners to prevent overheating. And that can cause your furnace to blow cold air. 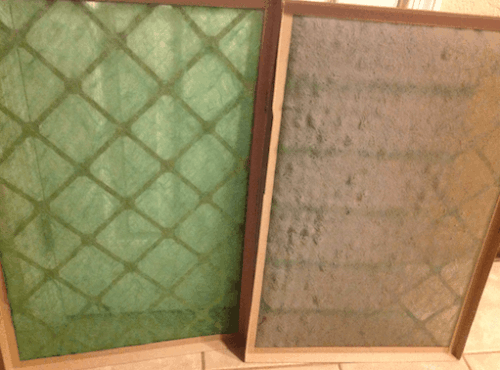 If your filter looks like the one to the right, replace it. Furnace still blowing cold air? So your furnace is blowing warm air but it’s barely blowing. Luckily, this problem can usually be solved by following the steps below. 1. Check your filter and change if needed. If your air filter is clogged, it restricts the amount of air that gets pulled into the system. And less air getting sucked in means less air gets pushed out. So change your filter if there’s a layer of dirt/dust covering the front. 2. Check for blocked return air vents. Your return air vents are responsible for drawing air into your system. But if you have furniture or drapes blocking the vents, you’re restricting the amount of air your system can “breathe” in. 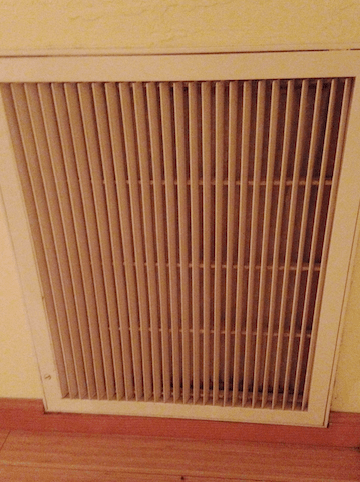 Take a quick check of all your return air vents and make sure there’s nothing obstructing the airflow. Move any furniture that blocks return air vents. 3. Ensure that supply air vents are open. 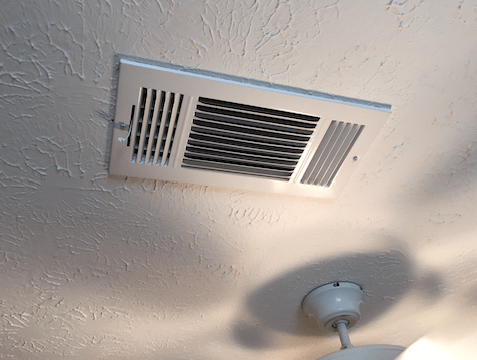 A lot of homeowners think that closing air vents will save money. But all it really does is increase bills, lower airflow and put extra strain on your system. So make sure that all supply air vents are open. Keep all supply vents completely open. If your furnace just won’t turn on, there are a lot of potentials reasons. But there are a few things you can do on your own to troubleshoot before calling in a professional. 1. Check your thermostat. Often, a furnace that won’t turn on can be traced back to the thermostat. Start by checking for dying batteries and replace them if needed. Then, check to make sure that your thermostat is set to HEAT and the fan is set to AUTO. After that, check for the “click” sound after you turn on the furnace. That click is the thermostat sending power to your furnace. So if you don’t hear it, your thermostat most likely needs professional repair. 2. Check the power switch. This switch gives your furnace the electrical power it needs to obey your thermostat’s commands. It looks like a light switch so it’s possible that it got switched off accidentally. Make sure your furnace switch is in the ON position. Need step-by-step instructions on how to troubleshoot a furnace that won’t turn on? Then check out our article, “Furnace Won’t Turn On? An AZ Tech Explains”. Furnace still not turning on? 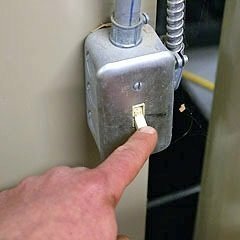 If you’ve checked your thermostat and power switch and read our troubleshooting article above but your furnace still won’t turn on, you should have a professional inspect your furnace. Need help from an AZ tech? Have a problem with your furnace that you can’t fix? We’re here to help. Just schedule your appointment with us today and we’ll send over an experienced Phoenix tech to get your furnace working again. What’s the Cost of Installing a Central AC in AZ?